QF-038B -- Regiment de Bearn, Grenadiers waiting in reserve. The Regiment de Bearne saw much action under Montcalm, and was present at all major engagements of the war. Although no longer used for their original function, grenadier companies were still part of French infantry battalions. They were still regarded as the “shock troops” who were hand picked from the biggest and strongest recruits. At Ticonderoga, Montcalm detached the grenadiers and held them as a reserve behind the main defensive line. 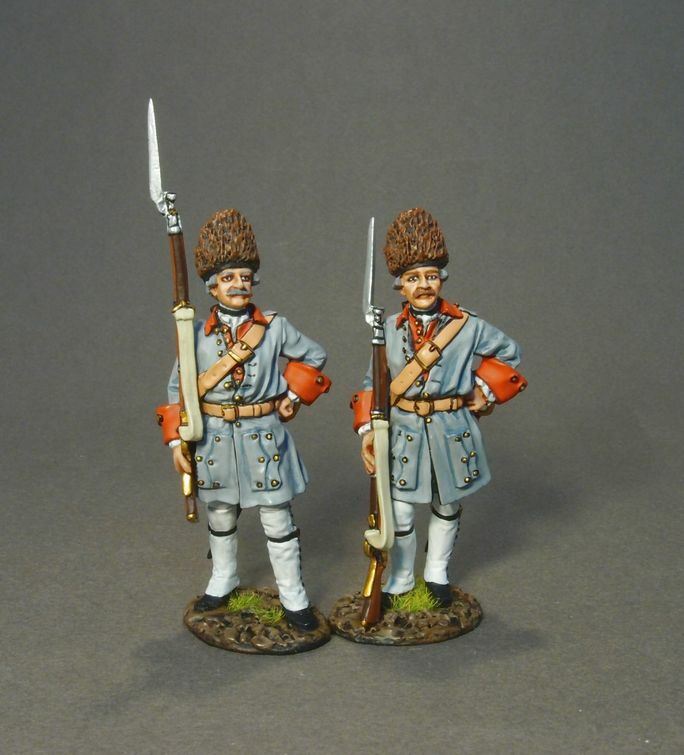 There were only minor differences between the line infantry and the grenadiers. Apart from the use of a broad tipped curved sabre in place of the usual straight sword, the Grenadiers were encouraged to wear moustaches, whilst other soldiers had to be clean shaven. As promised a set of the French Grenadiers wearing Bearskin Caps.